Ready for a double whammy? 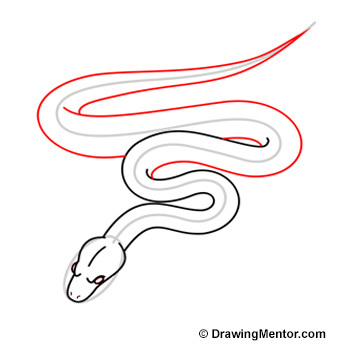 Learn how to draw a snake with two different tutorials covering two different poses. 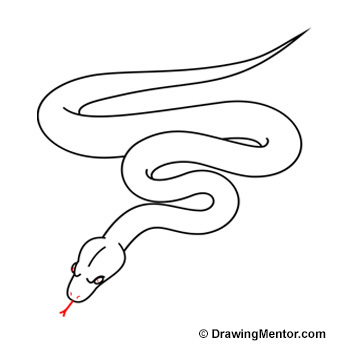 The first is a 6-step drawing tutorial of the snake slithering. The second tutorial is a 5-step tutorial of the snake striking. This is very cool! The biggest snake in the world is the reticulated python. This species of python can grow to a HUGE 30 feet (9 meters) long! Draw a squiggly line with an oval shape at the end. Take your time getting this shape right, so it looks like the image. Using the oval shape as a guide, draw the head outline, which is pear shaped. Then draw a single arced line in the middle of the head. After this, draw a wavy line to show the eye socket. See image on the left. Draw two lines that form the body. The first line starts on the left side, at the base of the head and follow the guide curve we created in step one. End this line in the middle of the second bend in the body. See image on the left. Draw a second line for the body from the right side, at the base of the head and follow the guide curve up and stop in the middle of the first bend in the body. See image. Now draw in the eyes with two curved lines. Finally we’ll add two dots for the nostrils at the tip of the nose. See image for reference. Now continue the left side of the body up and around to the point of the tail. Then continue the line for the right side of the body creating the second curve in the body. This stops at the third body curve. Then we draw the final line for the tail as we continue the right side of the body down towards the tail tip, creating a point. Now let’s create the forked tongue. Draw a line down from the tip of the nose in the middle. Then draw two lines out either side to create a ‘V’ shape. This creates our forked snake tongue. From here you can draw some lines on the body to create some scale patterns and even draw a spiral cylinder shape on the tail to turn your snake into a rattlesnake. Have fun! Draw two oval shapes at 90 degrees, overlapping each other on one end. Now draw an ‘S’ curve starting on the left of where the oval shapes intersect. Draw the line down in an ‘S’ shape down and away from the ovals. The line and ovals form our general shape. Refer to image. Now draw the top and lower jaw shape, using the ovals as a guide. Now draw two lines to start the body. Draw the first body line starting half way down the jaw and out to the left in an arc, stopping the line before hitting the ‘S’ line we had drawn in step one. Now draw the second body line parallel with the ‘S’ line we have previously drawn, starting at the bend in the ‘S’ line and down at 45 degrees. See image reference on left. First, let’s draw two lines for the inside of the mouth. The first is a short line from the top of the jaw, down to the bottom. The second mouth line starts at the top tip of the jaw, and follows the oval shape we drew in step 1. This line stops about half way along the oval shape, then continues straight down to the bottom tip of the lower jaw. For the eye, draw a circle in the eye socket at the top of the oval shape. For the body we’ll draw two lines. The first starts at the back of the head where the two oval shapes intersect. This line follows the ‘S’ line out to the left and around, back towards the bottom of the jaw forming a ‘U’ shape. The second body line starts at the lower jaw and follows the ‘S’ guide line downwards. Refer to reference image. It’s time to add the fangs. 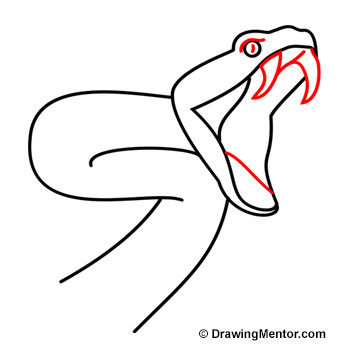 Draw a sharp curved fang just below the eye. The second fang on the right starts at the tip near the nose and arcs down. Add a line or dot in the middle of the eye for the pupil, and draw a small arc just above the eye to make the eye ridge. Finally, draw a line for the inside of the mouth. See reference image for placement. That’s it, we are now complete. Feel free to draw your own scales around the body and add your own tongue.